Hog Crazy: Boemer uses Red Wattle and Berkshire hogs from southern Minnesota, going through a whole animal every two weeks. 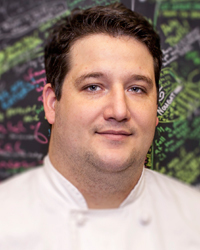 Heartland Pride: "I feel like the Midwest has a lot to contribute to the food culture as a whole. I've worked in the opulence of a Michelin-level restaurant. But the Midwest approach is very simple: [It's] 'I don't need all that.' There's a Midwestern way that things are done, and that doesn't have to mean steak and crappy burgers."